In the clinical course of nephrotic syndrome (NS), hypercoagulable state and thrombosis are well-known and frequent complications. Several factors contribute to the dysregulated coagulation state of NS although all the reasons are not clearly understood [Figure 1]. The pathogenesis of hypercoagulability in NS is determined by a lack of balance between factors involved in normal anticoagulation/antithrombosis mechanisms and procoagulant/prothrombotic factors with associated abnormalities in platelet activation that promote in situ thrombosis in deep veins or arteries. In this issue of the Journal, Nandwani et al. describe such a case in a middle-aged man with membranous nephropathy who was in remission and presented with severe abdominal pain. He was diagnosed to have left renal artery thrombosis and areas of renal infarction. NS may be considered as a model for the study of link between low albumin levels and platelets. In fact, platelet aggregation may be mediated by the inhibitory mechanisms of albumin, as decreased conversion of arachidonic acid to thromboxane A2 and increased conversion of endoperoxides to prostaglandins. Platelet activity usually inversely correlates with serum albumin levels (e.g., in course of remission or relapse), and it is potentially reversible by adding albumin in vitro or following albumin infusions. Furthermore, many other important hemostatic proteins of similar size are also pathologically excreted in the urine. The loss of antithrombotic factors in the urine is counterbalanced by an increase in plasma, procoagulant cofactors, such as factor V, factor VIII, and fibrinogen. The risk of developing thromboses is considered a major complication of NS. Membranous nephropathy, membranoproliferative glomerulonephritis, and minimal-change disease have a higher risk of thromboembolism than other nephropathies. Higher risk of venous thrombotic events and arterial thrombotic events has been demonstrated within the first 6 months of diagnosis of NS in adults and in relation to administered drugs, steroid-sensitive NS had a lower risk of thromboembolism than steroid-resistant NS. Arterial thrombosis and their clinical complications is less well known because of the lower frequency compared with venous thrombosis. The most common arterial sites of thrombosis are femoral arteries, and more rarely, other arteries such as pulmonary, iliac, mesenteric, axillary, subclavian, brachial, carotid, brachiocephalic, ophthalmic, cerebral, meningeal, and coronary arteries. In NS patients, arterial thrombosis is often associated with administration of steroids and diuretics. Steroids could increase factor VIII levels and other serum proteins, promoting the hypercoagulable state by different mechanisms. The antiedema action of diuretics could induce water losses and a negative fluid balance. An abuse of these drugs represents an additive risk for dehydration and the subsequent venous and arterial thrombosis. Moreover, hyperlipidemia could lead to subintimal lipid accumulation at the level of previous arterial wall injury. Therefore, platelet clumping and adhesion promoted by elevated protein-bound fatty acids may facilitate arterial thrombosis. In the clinical course of NS, prophylactic anticoagulation and thrombosis treatment are not clearly established because large randomized trials and guidelines are lacking. The decision of when and how to anticoagulate a patient depends on several factors. In addition to anticoagulants, other medications may help in the prevention of thrombotic events as statins and antiplatelet drugs. No levels of proteinuria or hypoalbuminemia have been established to start anticoagulation even if a reasonable recommendation is to anticoagulate in the presence of proteinuria in nephrotic range and serum albumin <20 g/L. Conventional anticoagulation with heparin or warfarin remains the standard therapy in the presence of demonstrated thrombosis. Some new oral anticoagulants, acting as inhibitors of factor Xa or factor IIa, have been approved for atrial fibrillation and as prevention of stroke. These drugs are potentially useful for any thrombotic event and may have a role at least in the preventive treatment of NS-related thrombosis. Compared with classic oral anticoagulants, these drugs provide fewer interactions with other drugs and food, have fixed doses and a more predictable pharmacokinetics. Some of these, especially dabigatran and rivaroxaban, have an important component of renal excretion and a higher risk of accumulation and bleeding in the presence of chronic kidney disease just like low molecular weight heparin. Discontinuation of anticoagulation therapy depends first on the persistence of nephrotic proteinuria that may trigger recurrent events. In the absence of other indications, patients who achieve remission of NS should have anticoagulation for the next 6 months; even in the clinical course of NS, it is particularly difficult to achieve the goal of prefixed international normalized ratio with oral anticoagulants because of the low levels of albumin. Thrombolytics should be administered only when a major event, such as bilateral RVT or massive pulmonary embolism, occurs. In fact, these agents have high risk of bleeding as a most important complication and require careful administration, especially in patients with NS. Nandwani et al. managed the patient under discussion with selective intra-arterial thrombolysis and stenting with good outcome. The peculiarity in this patient was that this vascular catastrophe occurred when the patient was in remission. For the prevention of thromboembolic events, antiplatelet drugs are frequently administered in nephrotic patients, especially in those at a lower thrombotic risk. Acetylsalicylic acid is an antiplatelet inhibitor of thromboxane production, used for prevention of cardiovascular and thromboembolic events. Because several patients are resistant to aspirin treatment, thienopyridine derivatives as clopidogrel are useful alternative drugs although the potential adverse effects and the lack of clinical trials restrict their administration. Ponticelli C, Glassock RJ. Treatment of Primary Glomerulonephritis. 2nd ed. New York: Oxford University Press; 2009. p. 21-6. Nandwani A, Pathania D, Jha PK, Kher V. Renal artery thrombosis with renal infarction: A rare cause of acute abdomen. Indian J Nephrol 2017;27:313-5. Mikhailidis DP, Ganotakis ES. 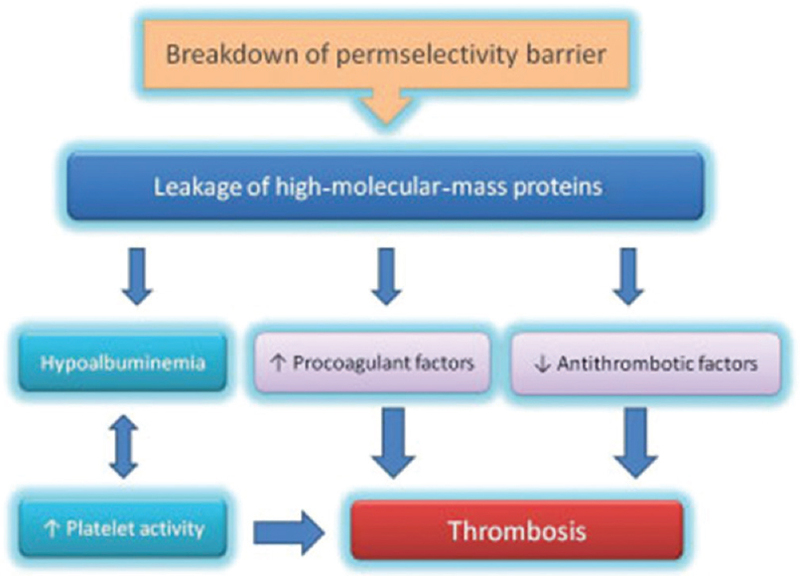 Plasma albumin and platelet function: Relevance to atherogenesis and thrombosis. Platelets 1996;7:125-37. Remuzzi G, Mecca G, Marchesi D, Livio M, de Gaetano G, Donati MB, et al. Platelet hyperaggregability and the nephrotic syndrome. Thromb Res 1979;16:345-54. Glassock RJ. Prophylactic anticoagulation in nephrotic syndrome: A clinical conundrum. J Am Soc Nephrol 2007;18:2221-5. Barbano B, Gigante A, Amoroso A, Cianci R. Thrombosis in nephrotic syndrome. Semin Thromb Hemost 2013;39:469-76. Akoglu H, Agbaht K, Piskinpasa S, Falay MY, Dede F, Ozet G, et al. High frequency of aspirin resistance in patients with nephrotic syndrome. Nephrol Dial Transplant 2012;27:1460-6.